Quora has just launched a bundle of interesting initiatives over the past day or so, all signs that the Q&A site is trying to figure itself out. First of all, the company has begun testing something called “Ask to Answer Suggestions” where users start out with a budget of 500 Quora credits (Quoins?) and can offer to pay other users in credits to answer questions. The price for questions will eventually increase or decrease based on answerer’s zeal for answering questions and level of topic expertise. From an email sent out to beta testers (because I’m a TechCruncher I’m not in the beta, nor can I see the Quora FAQ, which I’ve included below). “Since experts only have so much time to answer questions, we are also introducing credits as a bookkeeping mechanism so that incoming requests to a user stay at a manageable level. Note, these credits aren’t something that can be exchanged for cash only for answers to questions. Basically as it scales the company is experimenting with incorporating game mechanics into its processes in order to get people to give more answers. The more and more mainstream/non-tech people join, the more likely it is that questions will go un-answered because the incentive that makes techies answer questions (esteem within our close-knit community) just isn’t there for a wider audience. Nothing is more depressing than an unanswered question. If Quora power user Semil Shah is currently offering people $100 on Zaarly to answer his Quora question about the most foundational web companies of all time, in-service credits are worth a shot. In addition and more formally, the Q&A site has also added the option to include location and employment information in user profiles, letting users broadcast social and business information like where they live, go to school and work. The new profiles also allow for Facebook-style status updates, presumably because people were already using the question functionality to post non-questions. The startup exploded last December and has been rushing to catch up with its success ever since. With these recent steps we’re seeing the beginning of a more quantified user economy emerge, on based on reputation and expertise in providing information. Quora needs some kind of way to identify experts, and is figuring it out through iterating as it goes along. The Quora Credits FAQ, below (btw, if anyone wants to send me a screencap of their credits budget, my email is really easy to figure out. And while you’re at it …). Update: And we’ve got a screencap. 1. 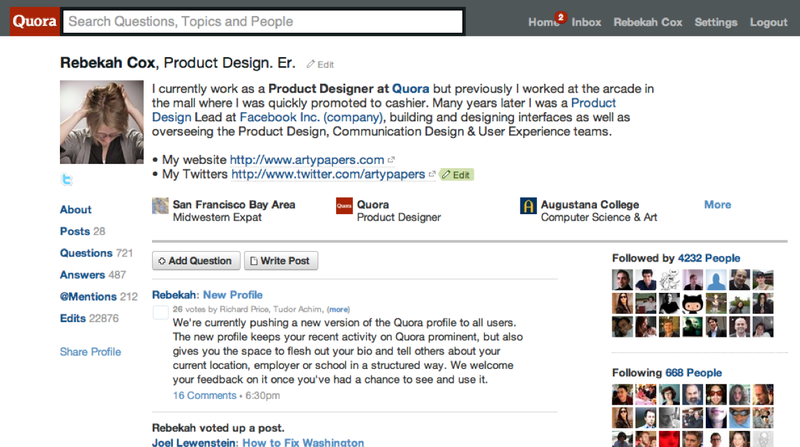 What are Quora Credits? To help users get great answers faster, we’re launching Ask to Answer Suggestions, which help you find the people who are most likely to be able to answer your questions. Now instead of only being able to ask people you know or those whose answers you’ve seen, Suggestions identify people who have related expertise to help you. But since experts only have so much time to answer questions, we are also introducing credits as a bookkeeping mechanism so that incoming requests to a user stay at a manageable level. Everyone starts out with a budget of credits, which can be used to ask other people to answer questions. (For now, only people who are in the private beta will be part of this system). To start, it will cost the same number of credits to ask anyone a question, but prices will change over time to keep the number of requests to a user manageable. Users who are responsive and signal that they enjoy answering questions will see their prices fall, making them affordable to more users, resulting in more requests. Prices increase for users who aren’t answering requests and might prefer fewer requests. 2. 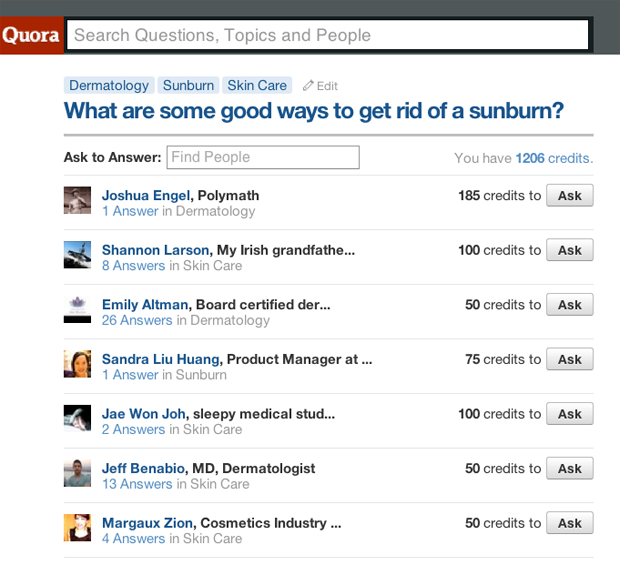 How are Quora credits earned? You can earn more credits in a few ways. Answering Ask to Answer requests: You’ll receive credits for answering ask-to-answer requests (an amount equal to your price). Getting upvotes on answers you’ve written: You’ll get credits for any new upvotes (not just from beta users) on any answer or post you’ve written on Quora. An answer you have solicited (via Ask to Answer request) receives upvotes. Credits given to you by other users: Users can give credits to each other whenever they want. Occasional system refreshes: We’ll provide credit refreshes if you go for a while without enough credits to ask the average priced user. 3. How is my price determined? Credits are a bookkeeping mechanism for Ask to Answer Suggestions to ensure that frequently suggested users don’t get inundated with requests. The prices that are set for each user reflect how responsive a user has been to prior requests and have nothing to do with the quality of potential answers. Users who are responsive to requests signal that they are willing to provide answers when asked. As a result, their prices come down while their ranking in suggestions improve to make them affordable to more users, resulting in more requests. On the other hand, prices increase for users who aren’t answering requests and might prefer fewer of them. If you receive numerous requests to answer and do not respond by writing answers, the system increases your price and ranks you lower in suggestions; in essence, it infers that you are too busy to answer or not interested in answering, both of which mean, on average, that we should send fewer requests your way. Two users with the same price may have different levels of expertise, because their prices reflect similar rates of responding to requests. Conversely, two users with similar levels of expertise may have different prices, based on different response rates. 4. What happens if someone does not respond to my request to answer? Do I get a refund? If a user who is asked to answer responds with an answer within a week, he or she receives the price paid by the asker. If the user has not answered after a week has elapsed, or clicks to ignore the request during the week, 75% of the price is refunded to the asker; the remaining 25% is still paid to the potential answerer for having received and considered the request. 5. Why are some users free to ask? If you and another user in the beta are both following each other, you can ask each other questions without having to pay in credits. This is because we assume you are likely to know each other and did not discover each other through Ask to Answer Suggestions. 6. What happens when I interact with users not in the beta? You can request answers from users who aren’t in the beta by typing their name into the Ask to Answer box. These requests will neither require payment nor show up in your credits pages. Similarly, people who are not in the beta test may still ask you to answer questions, too. These will work as they did before except they will not trigger notifications and you will not receive credits for answering these unpaid requests. They will not expire and will appear on at the bottom of your Ask to Answer page with old requests you received prior to the beta. 7. How does giving credits work? You can give credits you have earned at any time to anyone else in the beta. The only restriction is that the amount you have available for gifting is your current balance minus 500 credits. This is to prevent users from creating many accounts and accumulating a huge amount of credits by transferring them to a single account. 8. What happens if I run out of credits? If you do not have enough credits to ask someone to answer, you will not be able to do so. Periodically, users who have fewer than 100 credits will receive a refresh to top them up to 100. For example, if you had 0 credits left before the refresh, you would have 100 after the refresh. If you had 60 left before the refresh, you would also have 100 after the refresh. 9. What are the terms of the private beta? As this is a beta, you can expect the features to evolve and change just like the rest of the site, potentially faster as we get your feedback. If we decide to roll out Ask to Answer Suggestions more broadly, we will cancel the beta credits and issue entirely new credits to all Quora users. We will issue the new credits to beta testers in proportion to the number of beta credits you have at the end of the beta period. 10. I have feedback, questions or bugs to report. What should I do? Please email feedback@quora.com with “BETA” in the subject and describe what happened in details so we can help investigate. 11. Why is Quora introducing credits? Our goal is to help make each question page on Quora a valuable, reusable resource. One part of getting more great answers is helping users find experts who can contribute to each page. We decided to focus now on Ask to Answer suggestions because it is an opportunity to discover great contributors who otherwise might be unknown to you, and also to find out where your expertise is sought. We’ve found that people generally like helping each other, and new Ask to Answer Suggestions are designed to make that easier. In making suggestions prominent in the Quora interface, we have to be considerate of how available users are for answering questions on Quora. Credits allow us to calibrate how many requests a user might get, so that nobody is overwhelmed. Automatically setting the price of asking a user based on that user’s past responsiveness keeps the system flexible and dynamic while removing a complex decision. In developing credits, we’ve thought carefully about the economics — both at the level of each user, and of the system as a whole. Price movements and rewards are designed to help the system quickly reach a sustainable equilibrium, and to make using credits intuitive and fun. As with all theory, we need to see how our ideas work in the wild, and that’s where this beta comes in. We welcome your questions as you use the features, and your feedback about how things can be improved. We have numerous ideas for how we might iterate on the product and look forward to continuing to improve Quora with you.